Welcome to this four-bedroom, two-and-a-half-bath executive home situated in one of the most sought-after locations of The Landings. Professional and mature landscaping and lighting welcomes you through the leaded glass door and foyer. This open floor plan flows seamlessly for gatherings or privacy with an expansive and open kitchen with a new refrigerator and microwave, convenient center island and separate bar. The adjacent atrium lets the outdoors in, while the family room boasts a white quartz stone, wood burning fireplace and direct access to the pool. This split plan design offers vaulted ceilings with a flexible four bedrooms/office. Enjoy the new second bath which boasts high-end Kohler fixtures and more. The master suite offers a walk-in closet, new wood floors, a roomy master bath with dual sinks, walk-in shower and deep soaking tub with a view of an atrium. 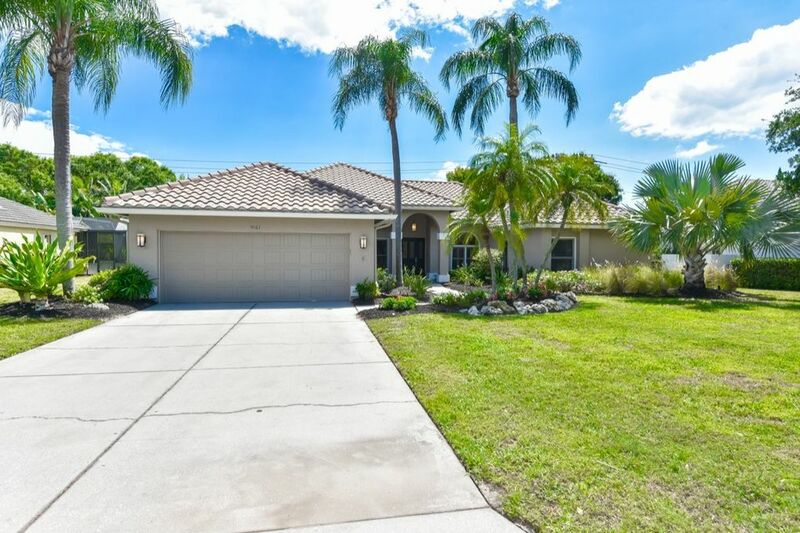 Enjoy the outdoor screened pool, lanai and entertaining area which is perfect for a relaxing swim and family gatherings with direct access to the newly renovated spectacularly modern pool/guest bath. This gated community is Sarasota’s hidden gem, offering a 24-hour manned gate, 72 heavily landscaped acres with bike trails and a community gazebo on the Intracoastal Waterway. Landings Racquet Club has 8 Har-Tru tennis courts, fitness center, large heated swimming pool and spa. Truly minutes to The Phillippi Creek Marina, top-rated schools, Siesta Beach and downtown Sarasota, the location is unbeatable. Click virtual on tour to see more photos. Driving Directions: Tamiami Trail (Hwy 41) to West on Landings Blvd. (just south of Proctor Rd.) Go through the guard gate and follow Landings Blvd. as it turns left, turn left on Kestral Pkwy South, then right on Flicker Field Circle. House on right.